I’ve been a bit disconnected from my computer these past few weeks. This has been an awesome time to spend with my family and my friend who is visiting from Mexico via Japan. We visited Puncak for a few days and were able to relax and just have a nice time with the boys. We were able to visit Taman Safari for a second time and Joshua was so happy to be part of the ride. I’m on full-on party planning mode for Joshua’s First Birthday and I am working on every detail to make his day special. So far I’ve finally decided on a theme and I’m working on making stuff happen while planning on hosting a Thanksgiving dinner for 15 people next week. I did rebel and put out all of my Christmas decorations since I decided I didn’t have enough Thanksgiving stuff to make the apartment festive enough. Overall, I’m just grateful for family and friends and I’m just taking it slowly and juicing every moment I spend with the boys and the hubby. A nice surprise this past week was that I had to honor to be nominated to two awards these past two weeks. I love writing about our crazy adventures and was very excited to find these nominations. 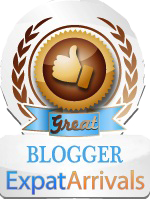 The first is the Expats Blog Award for 2012. I totally didn’t expect it and I just found out it will be decided in late December and a Gold, Silver and Bronze award will be granted for each country. One of the judging criteria will be based on reviews left on my listing on their website. I’m terrible at this but if you guys like Stumble Abroad it would be awesome if you could leave a comment on the listing here. The second award was a very sweet surprise nomination to the Liebster Blog Award by an amazing fellow blogger Becca from the Dabblist. A Liebster (a German word for favorite) is a blogger-to-blogger award for blogs with less than 200 followers. I have to tell 11 things about me. Ask 11 questions to 11 bloggers that I nominate. I have lived in 8 different countries in the past 12 years. Mexico, Canada, USA, France, Belgium, Germany, Thailand and Indonesia. I met my husband white-water-rafting. I love baking but hate washing the dishes afterwards. I’ve always dreamed of learning to dance tango, when I took classes, I decided that dream was just not for me. I love having a crammed busy schedule. I color-code each activity on my calendar depending if it’s for me, for Evan, Josh, both kids and a holiday. I could live on Thai sticky rice with mango. I’m half Nicaraguan (my mom was born there) but haven’t visited Nicaragua yet! I buy post-its every time I see a cute set I don’t already own. I often go OCD and get rid of half the stuff in my closet and regret it the next week. I love the Disney Channel Shows and are sooo glad to have an excuse to watch them. 1. Last meal on earth – what are you having? Pumpkin Green Apple Soup and a big chocolate brownie. 2. If you had to teach something, what would you teach? Seeing my two little boys smile. 5. What are you grateful for most today? 7. If you could live in any other country, which one would it be? What a good questions. I don’t even know where I would like to live right now. If I could live in Paris, then France. Otherwise, maybe the USA? Argentina has always been high in the list. Changes every few months. Lately, Joseph-Gordon Levitt. Although I’ve liked him since he did Angels in the Outfield haha. 10. What does your happy place look like? Any European garden during the first weeks of Spring will do. 11. What do you want less of in your life? These all probably have over 200 followers but it’s a fun activity anyway. Everyone, please don’t feel compelled to answer the questions. I know how busy life can get. If you have some extra time, go ahead and have some fun! Last movie you watched at the Movie Theater? Who do you relate to the most? Carrie, Miranda, Charlotte or Samantha? If you could choose your nationality what would it be? Would you rather go to a beach or hiking? Are you a morning person or a late nighter? If you could only take 5 things on your suitcase the next time you travel what would they be? Little Black Dress or Little Bright Dress? I’m still working on that part but I promise I will get back to you soon! For now I leave you with one of the few pics I have of the four of us that my hubby was able to save from my drowned computer . 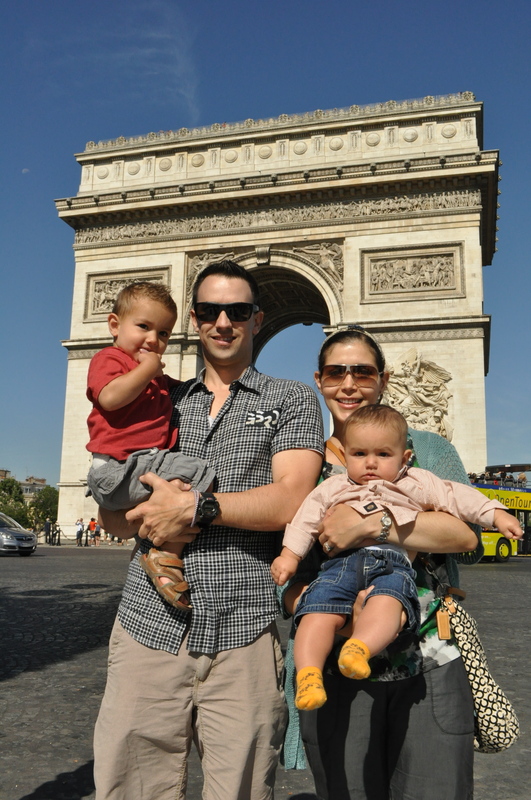 Congrats on being nominated for the Expats Blog Award, Ana! I’m rooting for you. Also thank you for passing along the Liebster Blog Award, so sweet of you! Thanks Maureen! And my pleasure. We miss white water rafting! I’ve heard there are some great places in Indonesia to do it! 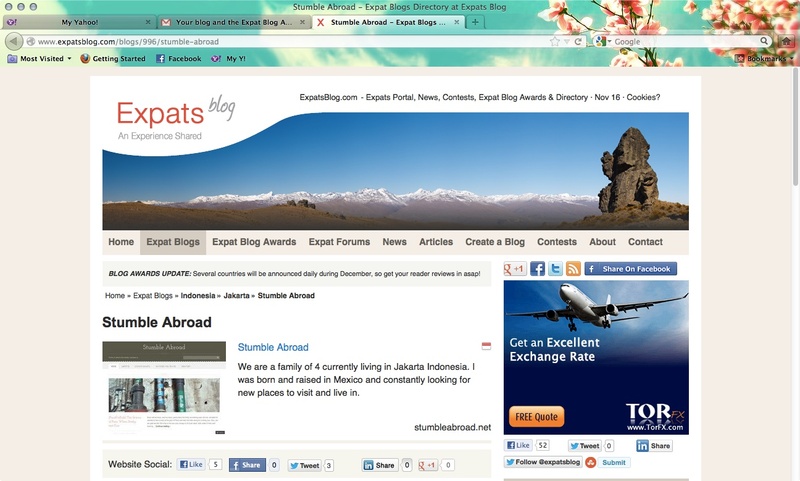 Congratulations on Expats Blog Award nomination! I just voted for you! I hope you will win! Thank you for nominating me to the Liebster Award. I was nominated by another blogger and just told her that I would not have the time to play along. I am afraid that I have to tell you the same and I am sorry… I hope you’ll understand! I didn’t know that you would teach Geopolitics!! Paris would be really cool to live. It was nice to read about you and you have some good questions! Hope to see you soon! Hugs! Congrats on being nominated for TWO blog awards! Can I vote for the expat award though I’m not living in Indonesia? Hi Ruth! Thanks! You sure can. Thanks! And biig congrats on your book!!!! I just voted! Hope I’m not too late! It says that my comments need to be approved first before it appears. Thanks Ruth!!! I hope you are having a great weekend! If you could only take 5 things on your suitcase the next time you travel what would they be? Camera, iPad, body lotion, chapstick, toothbrush. Thanks!!!! And yeah, thiis is the first one I’ve accepted. I have a few others but I don’t even remember in what post they were… oops…. Thanks for answering. I know this is certainly not on anyone’s priority list…. Thanks for voting! I hope you had a wonderful Birthday week! Congratulations! I just left a comment on your behalf (I think it is pending approval). How exciting to know that something that probably started as a personal project/way to stay in touch with friends and family has grown into something so big that has reached so many people and introduced you to new friends. Thanks! It has certainly been fun and it still is something I really enjoy! I hope it stays that way haha. I have met and e-met some awesome people and this has been the greatest reward of all!